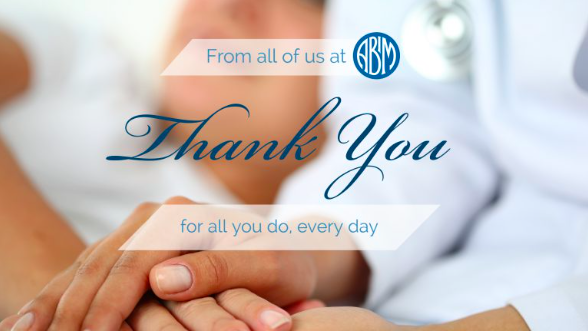 As we say goodbye to 2017, we say goodbye to a year of unprecedented exposure of the interconnected workings of the Accreditation Council for Graduate Medical Education and its member organizations, the American Board of Medical Specialties (ABMS), the American Medical Association (ABMS), the American Hospital Association (AHA), the Association of American Medical Colleges (AAMC), and the Council of Medical Subspecialty Societies (CMSS) that continue to ignore the corruption inside their walls. Money does that to people. We should not be surprised. 4 January 2017 - Richard Baron, MD and Clarence H. Braddock, III, MD publish a promotional article for ABIM in the New England Journal of Medicine and given the comments, probably wish they hadn't. 20 January 2017 - Stationary sidebars can be revealing: The interconnected conflicts of interest with University of California, San Francisco, MOC®, the New England Journal of Medicine, and the ABIM/ABIM Foundation are disclosed. 6 February 2017 - Practicing Physicians of America, Inc is born and requests IRS investigation of the ABIM at the Library of Congress in Washington, DC. 6 February 2017 - TeamHealth eats the Department of Justice's $60 million judgment for Medicare fraud, but is swallowed quietly by Blackstone Group. 17 March 2017 - Federal judge dismissed ABIM's copyright infringement suit against Puerto Rican Dr. Salas Rushford. Salas Rushford's countersuit to proceed. 21 March 2017 - Wallstreet lawyer attempts to attack the integrity of the investigative reporting on this blog concerning the ABIM's Director of Test Security. Rebuttal appears in Pennsylvania Medicine Magazine and becomes the most read blog post of 2017 thanks to the Streisand Effect. 31 March 2017 - ABIM announces their much-anticipated "modifications" to their MOC program, gets it wrong again. 12 April 2017 - Elizabeth's Rosenthal's book An American Sickness appears on the New York Times best seller list, includes reference to the ABIM $2.3 million condo story. 29 April 2017 - The state legislative battle continued in Texas. 3 May 2017 - Journal of the American Medical Association devotes an entire issue to conflicts of interests in medicine, but forgets to disclose its own. 30 June 2017 - Anti-MOC legislation in Texas passes with some concessions, goes into effect 1 Jan 2018. 3 July 2017 - Practicing Physicians of America, Inc starts fund drive to assist with anti-MOC legislative efforts. 1 August 2017 - Research letter detailing the costs and fees for Maintenance of Certification® appears in JAMA. 6 Aug 2017 - ABMS responds to JAMA article on MOC® costs as "crucial to sustain and evolve." 18 October 2017 - Why the IRS needs to investigate the ABIM and its numerous corporate conflicts of interest. 11 October 2017 - Ohio legislature receive my testimony and an evidence packet on anti-MOC House Bill 273 regarding the corruption of the ABIM before the Health Committee. 4 December 2017 - A key meeting of State Medical Societies, ABMS and ABIM leadership, and numerous medical specialty societies convenes to discuss problems with MOC®; admits the MOC® process is "problematic." 13 December 2017 - ABMS and "partners" from other ACGME organizations including the AAMC and CCMS, alongside some select medical specialty societies, announce new "Vision Commission" to re-brand MOC®. More coverup seems inevitable. 13 December 2017 - Federal judge in the Northern District of Illinois dismisses the antitrust suit by the AAPS against the ABMS using a curious timeline, but leaves a door open to "file an amended complaint that cures the deficiencies discussed in this Memorandum Opinion." Today is New Year's Eve. Whether ABIM is solvent or not is uncertain. 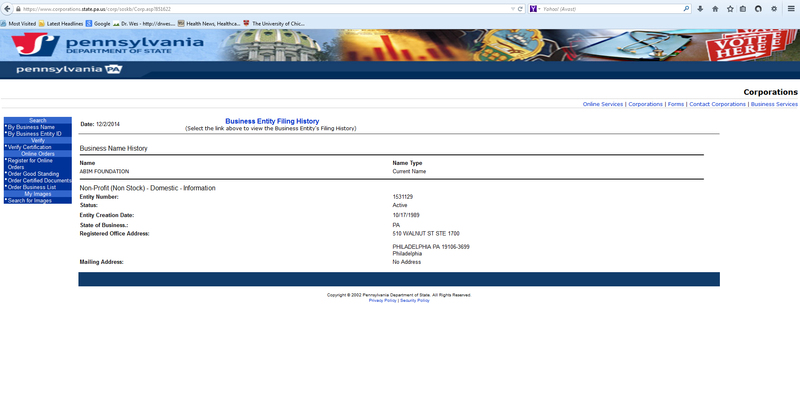 We will likely have to wait until May of 2018 to know for sure, since 501(c)(3) corporations can file a request to delay publishing of their Form 990 for Fiscal year 2017 until then. 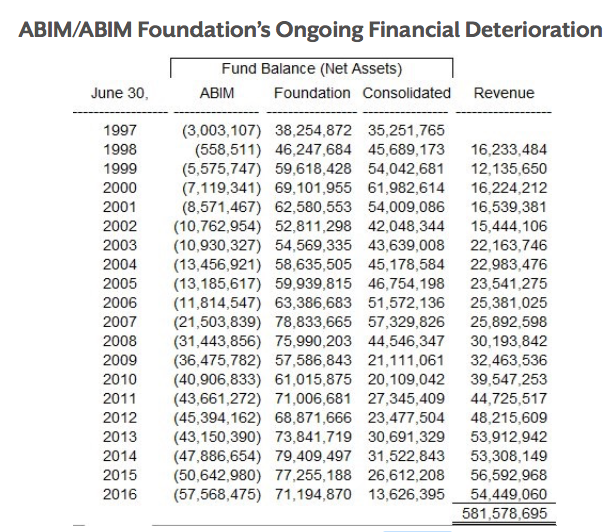 But the financial trend toward collapse of the ABIM and ABIM Foundation, legal troubles, and the unannounced closure of divisions within the ABIM, like the Division of Test Security and the Division of Policy in January 2017 give some hints to what is (and has been) going on there. Bit by bit, real clinic doctors are making a difference in fighting MOC®. I encourage all readers of this blog to consider joining or donating to Practicing Physicians of America or to become certified by the National Board of Physicians and Surgeons to help continue this fight. Together practicing physicians can make 2018 a successful and prosperous anti-MOC® new year for those of us on the front line of patient care. The federal court in the Northern District of Illinois has granted leave to AAPS to provide more detail as to how Maintenance of Certification (MOC®) harms patients in AAPS v. American Board of Medical Specialties, 14-cv-2705-ARW (N.D. Ill. Dec. 13, 2017). Because antitrust laws exist to protect consumers, not competitors, the court is requiring further specificity as to the harm to patients that is allegedly inflicted by MOC®. AAPS plans to add to its allegations ways in which representations made by ABMS and board-certifying societies harm physicians who decline to participate in MOC®. (emphasis mine) In the past some board-certifying societies have posted disparaging statements about physicians who do not waste the substantial time and money on remaining current with onerous MOC® requirements. For now, the court considers some of these pro-MOC® statements to be mere opinion, which is not actionable, but AAPS can submit stronger examples of unfair disparagement with its upcoming amended complaint. This legal struggle is far from over, and AAPS observes that earlier this year a district court in New Jersey held there is a valid claim for an antitrust violation by how membership in the American Osteopathic Association is required as a condition of maintaining certification by D.O.s. The AAPS case was initially filed in New Jersey in 2013 (https://tinyurl.com/ycndp3rx), and the courts have not acted until now, except to grant an ABMS motion to change the venue to Chicago. In dismissing the case as pled, the Court focused on the “voluntary” nature of MOC®. It had not been demonstrated that ABMS has sufficient market power to restrain trade, decrease output, or raise prices. “Antitrust laws protect competition, not competitors” (https://tinyurl.com/yapc4no5). Patients can supposedly find another doctor, or another hospital — somewhere. * AAPS should look no further than Blue Cross/Blue Shield of Michigan's disenrollment of Meg Edison, MD from several insurance panels and then sending her patients letters about the disenrollment solely on the basis of her failing to pay her Maintenanance of Certification fee. Their near instantaneous electronic collusion with an ABMS member board (American Board of Pediatrics) is damning and is facilitated by the for-profit wholly-owned subsidiary of ABMS, ABMS Solutions, LLC (domiciled in Atlanta, GA) selling Board certification status to third parties. AAPS should also be interested that Margaret O'Kane of the National Committee on Quality Assurance (that sets credentialing standards for insurers) is also a public member of the ABMS Board of Directors. It was almost Christmas, and you could hear the collective sigh of relief rising from the leadership at the American Board of Medical Specialties (ABMS). The antitrust suit brought against them by the Association of American Physicians and Surgeons (AAPS) was dismissed without prejudice on 13 December 2017 with one small caveat, "AAPS will be permitted an opportunity to file an amended complaint that cures the deficiencies discussed in this Memorandum Opinion." Whether the legal team of the AAPS will decide to amend the complaint remains to be seen, but much has been learned about the anti-competitive nature of the ABMS Maintenance of Certification (MOC) program since the time that suit was filed. No longer is the coordination of effort of the MOC program limited to an arrangement between the Joint Commission of Accreditation of Hospital Organizations and the ABMS member boards, but its tentacles extend to most of the membership organizations of the Accreditation Council for Graduate Medical Education (ACGME), the huge medical publishing companies (Wolter Kluwer and Reed Elsevier), many of the state medical societies like the Massachusetts Medical Society and their NEJM Group, the IPC Hospitalist Company (later purchased by TeamHealth, that was later bought by the mysterious Blackstone Group after the DOJ found them guilty of Medicare fraud), the international medical community in far-away places like Qatar and Venice, Italy (which have separate "standards" for Board certification), and even influence on our own local state legislatures. 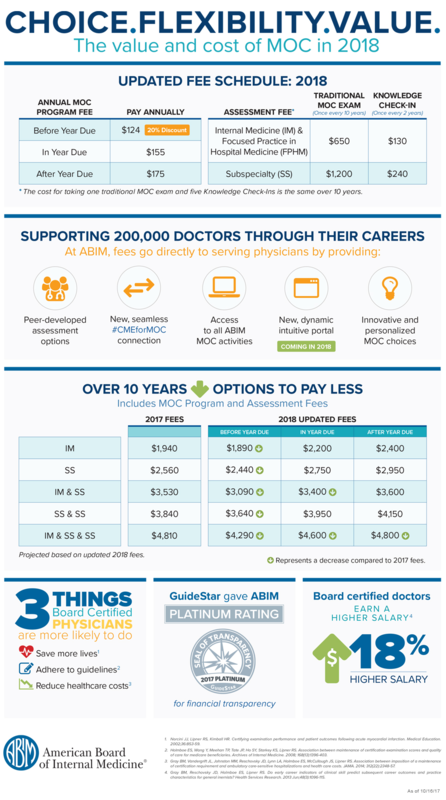 This is because we now understand that nearly 20% of our nation's economy (and much of our current academic medical system, each with their lucrative medical subspecialty societies) depends on ABMS MOC program succeeding. MOC is one of the critical keys to unlocking the data mine of physician behavior, purchasing, and influence via a HIPAA Business Associate Agreement that supplies the digital data fuel for the economic engine of health care today. An alternative to MOC without such an agreement would hurt this digital gravy train. But working physicians subject to the demands of MOC saw the program for what it was: a sickening power play using threats and intimidation to fund the ACGME monopoly and the ABMS Member Board largess at their expense. So those same working physicians took it upon themselves to start their own competing board, the National Board of Physicians and Surgeons. They took their concerns to state legislators and won a few key battles. By doing so, they exposed how insurance companies and hospital systems didn't really like that competition. They especially didn't like how physicians were coordinating their efforts. And somehow, along the way, those efforts have now piqued the interest of a few lawyers from the Federal Trade Commission. But the inner political workings of our court system need scrutiny, too. Recall that the 2013 AAPS suit was moved from New Jersey to the Northern District of Illinois (the AMA's back yard) in 2014 at request of lawyers from the AMA. Once there, the case docket had plenty of activity until January 2015, but then laid dormant for years. This did not stop the ABMS from declaring victory in the case on their website October 2, 2017. How did they know? More than two months before the Memorandum Opinion was issued by Judge Andrea R. Wood, it seems the ABMS knew something the AAPS lawyers did not. The court docket also revealed how the court dismissed the case before the Memorandum Opinion could be reviewed by AAPS attorneys. Perhaps this is usual and customary behavior by the courts, but given the gravity of the ruling and its implications to working physicians nationwide, working doctors want to know how the ABMS leadership knew of the case's outcome before the ruling was even issued. Do the tentacles of MOC extend to the courts, too? While the ruling is disappointing to most working US physicians, all is not lost. Not by a long shot. Thanks to the work of a committed group of working physicians who have raised the interest of federal regulators, MOC suddenly appears "problematic" for the ACGME. A new "Vision Commission" for "Continuous Board Certification" is being organized by the ABMS comprised of the same cohort of conflicted medical bureaucrats that created MOC in the first place. Nowhere in this list of "planners" are real frontline working physicians. And given this, nowhere is there likely to be any real change to the MOC system going forward. Lipstick on a pig by another name is still a pig. And no matter what this commission has planned as they delay and distract from the corruption that has occurred with MOC for the past 30 years when they issue their "findings" in 2019, MOC will remain a corrupt, broken educational product with serious conflicts of interest that needs to end now, not later. Things must be really bad for the American Board of Internal Medicine (ABIM). Since the organization has completely lost the trust of frontline working physicians, they are now now turning to nurse practitioners to promote their certification products - all at real working physician expense! It's official: MOC is dead. You heard that correctly doctors, the American Board of Medical Specialties' Maintenance of Certification® (MOC®) program is over, finished, kaput. The one thing that resonated loud and clear from the December 4th meeting in Chicago of the multiple specialty societies and state medical societies that were in attendance was "the current MOC® process is problematic." In a remarkably Orwellian twist of fate, a new "vision initiative" to reinvent "Continuing Board Certification" was just announced by the original MOC® creators serving as the "Planning Committee." The Planning Committee is comprised of representatives from the Accreditation Council for Continuing Medical Education (ACCME), Accreditation Council for Graduate Medical Education (ACGME), Coalition for Physician Accountability, Council of Medical Specialty Societies (CMSS), Council on Medical Education (CME) of the American Medical Association (AMA), the public, and the American Board of Medical Specialties (ABMS). We now see the ABMS and their sycophants at the ACGME, AMA, American College of Physicians, CMSS, and American College of Surgeons taking nominations for 21 to 25 individuals to serve on the planning Commission. This Commission will "bring together multiple stakeholders to assess the current state of continuing board certification and vision its framework for the future. ... Specialty societies, state medical societies, academic medical centers, hospitals and health systems, other health care systems, consumer organizations, patient advocacy organizations, ABMS member boards, and other groups are encouraged to submit nominations." This is not just a "pivot" to a new model. This is an attempted cover-up. Unless and until there is a full investigation of wrongdoing of these institutions regarding MOC®, including, but not limited to, potential tax fraud, misuse of physician testing fees for personal use, civil liberties violations, strongman tactics, and even possible racketeering, the current "vision initiative" should not be allowed to go forward, lest it happen again. After all, medical professionalism demands accountability and many, many doctors want to see justice served. Addendum: Nice to see at least one medical society voiced concerns regarding MOC at the December meeting. Pediatrician Meg Edison, MD gives her take on her "MOC failure:"
I am a diplomate of the American Board of Pediatrics against my will. I find it morally reprehensible to financially support an organization that harms fellow physicians. I find it demoralizing to know my money supports their lobbying efforts against our state MOC legislation. Yet I paid in order to see my patients. I paid so I could still be a doctor. The American Board of Pediatrics could ask for another $1500 next year, and I’d have to pay again. There is no choice. Is it possible I was targeted for being so outspoken on MOC? Possibly. My initial letter to the ABP has over 100,000 views. My medical society has used me on the cover of their magazine and their website dedicated to fighting forced MOC. The ABMS Senior Vice President knows me by sight, and has watched me testify against forced MOC in our state capitol on multiple occasions. But I’ve been contacted by countless quiet Michigan physicians threatened and decredentialed for simply refusing to pay for MOC. It doesn’t matter who you are, an outspoken physician with a state medical society behind you…or a solo practitioner quietly trying to stay afloat…you must comply. I don’t know the solution to this problem. It seems like every legal, logical, and ethical boundary that should prevent a certifying company from gaining such absolute unchecked power has been ignored, and every professional organization that should help us is impotent. My state medical society has held clear policy opposing board certification, let alone MOC, for insurance plan participation for 20 years. They’ve been negotiating for 20 years, yet aggressive MOC discrimination continues. The AMA has strong policy opposing MOC abuse, but refuses to do anything. The FTC should see this monopoly as a clear anti-trust violation. They are waking up, but still not acting. I am baffled the IRS doesn’t question the million dollar salaries raked in by these “non-profit” organizations. It seems like this would be a slam-dunk class action lawsuit for some smart law firm, but no one is interested in the case. State legislation is likely our best bet, but the lobbying power of insurers, hospitals, the billion dollar ABMS certification industry and their codependent specialty societies is nearly impossible to fight. If nothing is done, ABMS will win, because their entire coercive business model relies upon our professionalism. As physicians, we take an Oath to “Do No Harm”. We promise this to our patients. My first emotion when I heard my patients were forced to receive care in the ER was not anger at ABMS. It was gut-wrenching guilt. I dared to speak. I dared to fight. I underestimated their power. I was stupid enough to think MOC was a physician issue. It never crossed my mind that my patients would be harmed. I know better now. The next time they ask for another check, I will comply, and they know that. I just hope something is done before then. Primum non nicer. The Heart Rhythm Society (HRS) and American College of Cardiology (ACC), two organizations who stand to gain handsomely from their NCDR procedural registries, published a carefully-worded combined statement on "Lifelong Learning Requirements for Clinical Cardiac Electrophysiology (CCEP) Specialists" in their respective journals this week. In a glaring ommision, the publication concerned itself with how Relationships With Industry (RWI's) were handled by the authors, but failed to address the many known RWI's of the bodies that "approved" their statement, including the ACCME, ABMS and ABIM. These relationships include the known collusion of the ABIM with CECity, Inc (held by Premier, Inc, the largest hospital purchasing consortium), the Massachusetts Medical Society and its NEJM Group, the multibillion dollar Netherlands publisher and owner of UptoDate, Wolters Kluwer, PearsonVue, and the myriad of test security companies who benefit from the unproven MOC mandate. These are not minor conflicts. They strike to the very core of the integrity of our profession and physicians who must place the interests of our patients before all else. Setting the "rules" for lifelong learning is not required, integrity and honesty in dealing with patients is what is needed instead. Those internal principles cannot be simply articulated in the form of a published "guideline." This blog has carefully articulated the many civil liberties violations and ethical breaches perfomed by the ABIM (all sanctioned by the ABMS and perpetuated by the AMA) for the past four years. Financial cover-ups, tax fraud, HIPAA Business Associate Agreements that are not optional, and the use of a team comprised of a felonious "Director of Investigation", ABIM staff members, and members of the ABIM legal team to obtain physician emails covertly, so they could use that information to discredit and intimidate physicians, are our reality. Yet the ACC and HRS have decided to turn a blind eye to the corruption because it might disturb their business model. Using hugely conflicted certifying bodies to certify a professional position statement document is a problem the ACC and HRS have chosen to ignore to their detriment and the detriment of our professional integrity. "Fun, flexible, and refreshing way to earn your credit! Take a break from the bird and have your hand at a few." So said the American Board of Pediatrics' (ABP) Thanksgiving 2017 tweet seen here (now deleted). As if family time and the true meaning of Thanksgiving mean nothing to the American Board of Pediatrics (ABP). Rather, David G. Nichols, MD, the President and CEO of the ABP, must need to assure his Christmas bonus. 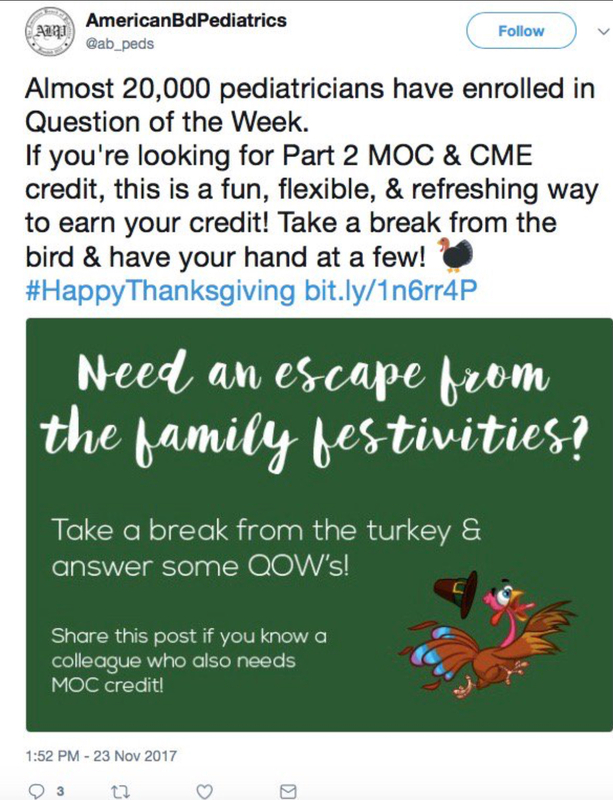 Boasting that "20,000 physicians enrolled in Question of the Week" (QOW), as if there was another option for pediatricians caught in the regulatory capture vice-grip of MOC®, speaks volumes about the motivation of this organization. In fact, the real world reality is that not signing up and paying for "QOW" risks a practicing pediatrician's ability to participate in insurance panels or to maintain their hospital privileges. "Thank you for all you do every day." 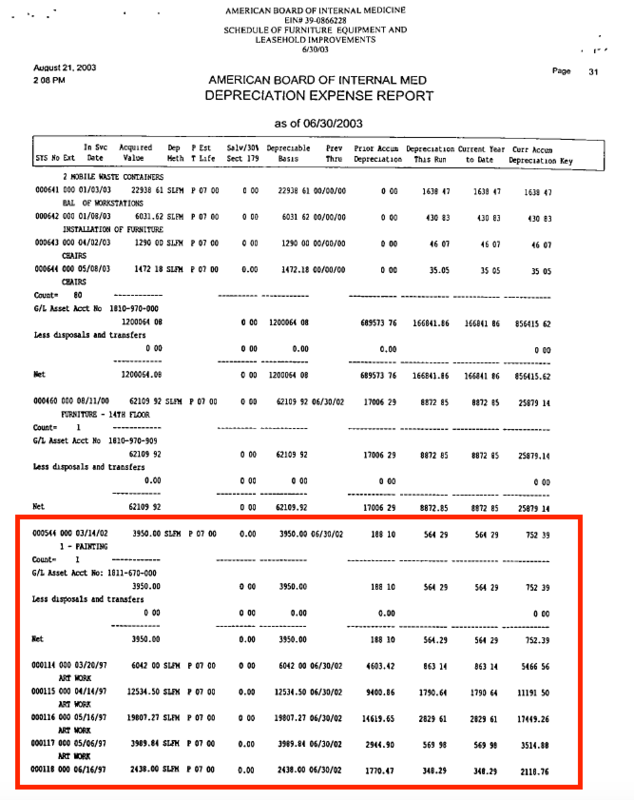 Now tell us, given the spending, financial shenanigans, and legal fees incurred by the ABIM and ABIM Foundation lately, are the ABIM and ABIM Foundation insolvent as at least one accountant suggests? Given the realities of the ABMS MOC® program that both organizations promote, placating physicians with such messages at Thanksgiving is akin to a child molester grooming his victims to earn their trust; it's about as ethically moribund as it gets. Use data and metrics to develop and priori­tize areas of need for child health policies. Provide state-of-the-art pediatric practice information in the context of a changing industry and professional landscape. Data would be captured through electronic health records, integrated health care systems, payers and existing pediatric disease registries. Data elements would include well-child and sick visits, chronic disease diagnosis and management, specialty care, and developmental and behavioral care. The registry also would include a patient portal to allow parents and patients to input data, while alleviating complications surrounding privacy laws. Create substantial improvements in child health and well-being. Accelerate advances in child health. Improve outcomes for children using data. Demonstrate the trajectory of child health through adulthood. 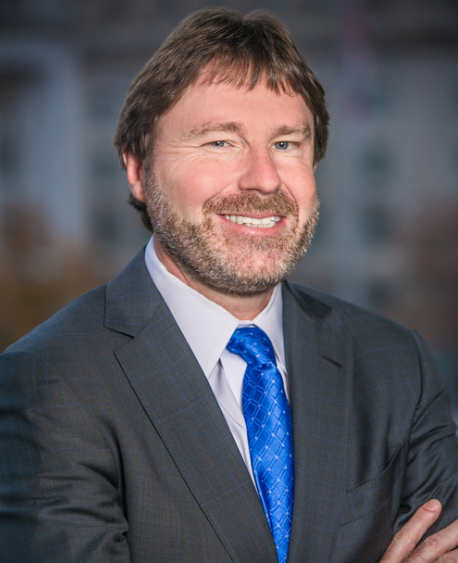 Among the benefits of this registry, Dr. Lehmann said, are tracking childhood health and illness trends, which would help draw conclusions on a number of areas, including gaps in care, treatment options and regional variations in care. The data also will help inform the creation of AAP guidelines and policies, and provide guidance to payers. 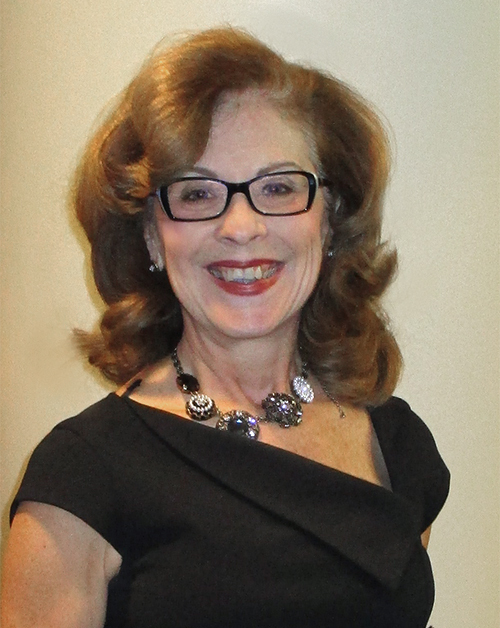 Members could use the data to help create reports for quality improvement projects, as well as for meaningful use and Maintenance of Certification, Dr. Lehmann said. Thanks to the Orlando Medical News for their comprehensive coverage Tuesday on the American Board of Medical Specialties' (ABMS) Maintenance of Certification (MOC) scandal. Physicians' best approach to collapse the current ABMS monopoly on credentialing standards remains mass non-compliance. Employed physicians (like myself) are finding noncompliance impossible without jeopardizing their employment, since many hospitals require their physicians to be "board certified" in their specialty. Since ABMS no longer "recognizes" lifetime certification as a valid credential (except for older "grandfathered" physicians who obtained their board certification before 1990), younger (more economically vulnerable) physicians risk the loss of employment if they do not participate in MOC and agree to the ABMS's "HIPAA Business Associate Agreement," becoming little more than data entry clerks for the lucrative insurance, pharmaceutical, and hospital industries. Is this really what our patient's want? I don't think so. Most patients I know would like to see their doctor look them in the eye rather than at a computer screen. Most want to be viewed as humans rather than a data profit center. And all of them want to spend more than 8 minutes with their physician. So how do physicians combat MOC? How do we preserve our ability to work without having to make extortion payments to the ABMS and their member boards just for their political and personal benefit? The development of an alternate certification board that is affordable and does not require physicians to comply with the ABMS/ABIM HIPAA Business Associate Agreement and comprised of highly-respected unpaid members of the physician community who understad the conflicts of interest inherent to the ABMS member board construct and is gaining acceptance hy hospitals accross the country. State-by-state legislation efforts outlawing the use of MOC as a condition of insurance panel participation, hospital privileges, or state licensure. Persuing other legal avenues, including anti-trust and class action suits against members organizations of the Accreditation Council for Graduate Medical Education, among others. I would encourage employed physicians who are given a professional stipend from their hosptial systems for professional society memberships to seriously consider using some of those fees to join Practicing Physicians of America in lieu of other conflicted professional and subspecialty organizations as we continue to push back against the MOC mandate (an example of to testimony and evidence provided the Ohio Health Committee here). Other areas to contribute include becoming certified by NBPAS or contributing to their advocacy efforts. It costs nothing to join the Facebook group Physicians Working Together, too. That group offers lots of productive ideas on how we can work collectively to restore the integrity of our profession. It is only through a corrodinated effort from a large portion of the working physician community that our freedom to truly work in our patient's best interest without unnecessary and unproven third party interference can be restored. This morning I received a press release from the American Medical Association (AMA) that said "New AMA Research Finds One in Five Physicians Ready to Reduce Clinical Work Hours." The press release pointed to "new research" (sorry, it's behind a pay wall) that appeared in the Mayo Clinic Proceedings from "experts" from the AMA, Mayo Clinic and Stanford University. The lead author of the research was Christine A. Sinsky, MD of the AMA. But what Dr. Sinsky fails to disclose in her article in the Mayo Clinic Proceedings, is she is also a Director of the American Board of Internal Medicine (ABIM) and a member of the Board of Trustees of the ABIM Foundation, serving as the Vice Chair. This is not a minor lapse in disclosure, since the ABIM Foundation and the entire national Maintenance of Certification debacle may become one of the largest medical education corruption stories in modern medical history. 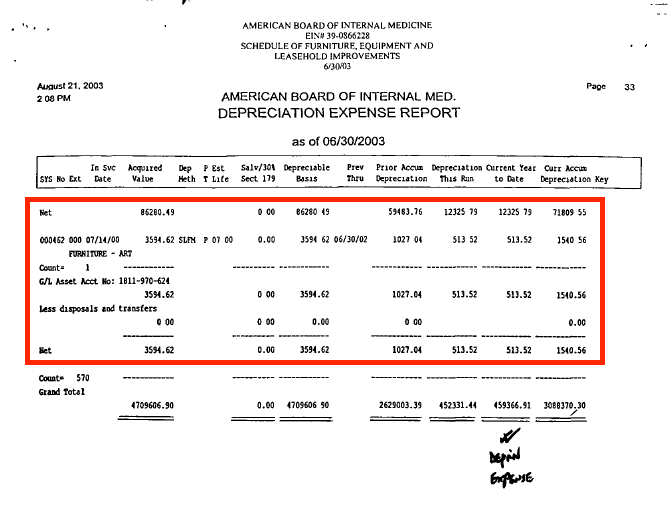 Funneling over $78 million dollars for ABIM testing fees behind physicians' backs to fund the ABIM Foundation appears of little importance to Dr. Sinsky. She is more concerned about our psychologic well-being rather than the behavior of the Foundation she runs with our Maintenance of Certification (MOC) cash. This corruption renders Dr. Sinsky's arguments why physician burnout is at an all-time high mute moot. Turning a blind eye to the facts only deepens physician frustration with our current bureaucratic leadership. If Dr. Sinsky is so concerned about physician burnout, why isn't she the leading spokesperson at the AMA insisting the leadership there end MOC as it was resolved by the AMA House of Delegates in 2016? Perhaps it's because she's too conflicted to understand the problem. Today Ohio legislators will be introduced to the concept of "Maintenance of Certification" or "MOC" when House Bill 273 is introduced by Representative Theresa Gavarone (R) to the Ohio Health Committee. Most of the Committee members won't have a clue what MOC is or why they should care. Lobbyists from the American Board of Medical Specialties (ABMS) and the American Hospital Association (AHA) will claim "the legislation puts patients at risk" and that "patients deserve to know their physicians are up to date" even though this statement flies in the face of the ABMS's own data and that of independent researchers. They even have the nerve to make statements like this: "Faced with a physician who was certified after residency who has not kept the certificate current, patients will be in the dark." Here's ABMS's ACTUAL history of promoting patient "safety" and knowing what patients think. Recall that in 1969, Dr. Thomas Brem, former Chair of the ABIM and President of the "Advisory Board of Medical Specialties" (our current ABMS) testified before the House Committee on Interstate and Foreign Commerce, stumped for Big Tobacco by testifying "neither can offer unequivocal scientific proof that smoking does or does not cause cancer of the lung." 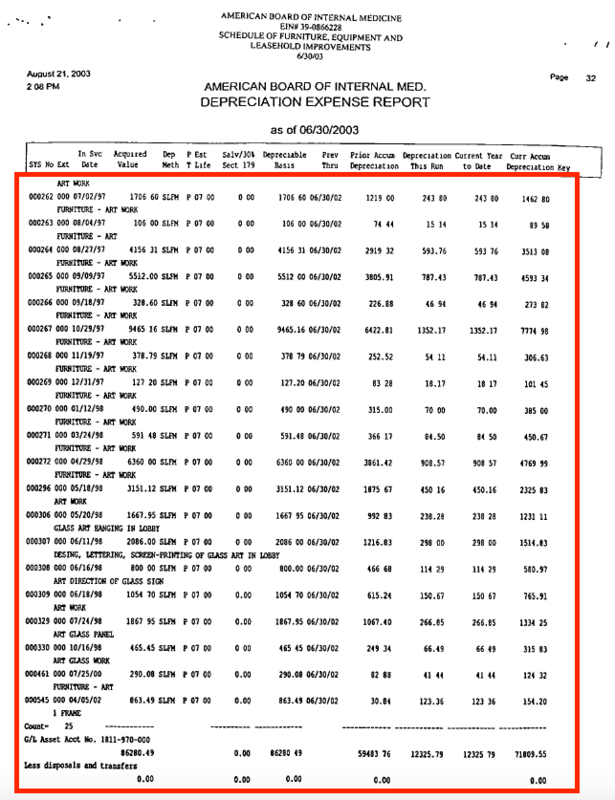 Dr. Brem conveniently failed to mention he was receiving payments from "Special Account No. 4" that was maintained by tobacco company lobbyists. How many lives were affected by this testimony? While we'd like to think this is just an isolated event, it was not. In fact, such corporate collusion has been the hallmark of the ABMS and their member boards as they shower themselves with lavish salaries and perks at the expense of vulnerable work-a-day physicians. For her entire career as President and CEO of the American Board of Internal Medicine, Christine Cassel, MD served on the board of directors of the Greenwall Foundation, Kaiser Permanente, Premier Inc and other organizations with quality health care agendas at diplomates' expense while never disclosing these conflicts of interest. It was only after she joined the National Quality Forum (that receives the majority of its funds from government contracts), that these financial relationships were exposed. Citing the "distraction" of it all, she quickly resigned her affilitation with Kaiser and Premier, but not before bilking her unsuspecting ABIM colleagues for over $8.9 million and free travel for her spouse and helping to facilitate the $400 million purchase of CECity, Inc. by Premier (in which she held stock). Robert Wachter, MD, the golden-boy of corporate medicine and promoter of hospitalist medicine, was also former chairman of the board of the ABIM for a time. He, too, would rather not discuss his "love agenda" for medicine once his relationship with IPC The Hospitalist Company was exposed by the Department of Justice for overbilling patients. It is no wonder he brought down his industry-sponsored blog, Wachter's World. 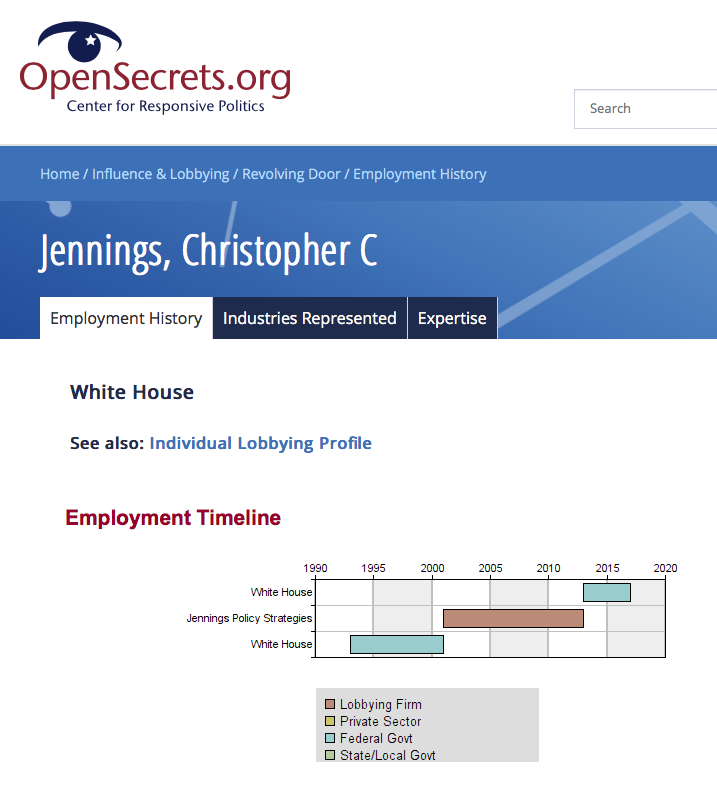 Other ABMS member boards and their corporate partners would also not like legislators to examine the American Board of Pediatrics, who saw no problem giving James Stockman, III, MD a $2.4 million golden parachute to help fund his car collection and retaining him to work eight hours a week for a $793,438 annual salary. Who funds such largess? James Puffer, MD of the American Board of Family Medicine and their directors have also enjoyed high salaries while quietly funding his organizations' Foundation's purchase of corporate office buildings and running for-profit real estate management companies. I'm not sure I've ever seen a clearer quality and patient safety initiative funded by diplomates. The truth be told, MOC is a horrible embarrassment to our profession. We are doctors, for goodness sake. We are not funding vehicles for political and corporate agendas. It is sickening to me that we continue to see medical specialty societies joining the ranks of these highly-conflicted organizations so they can dovetail their lucrative data registries with maintenance of certification as their next sure-fire business model. Is spending time, energy and money lobbying on Capital Hill to keep such registries funded on the backs of working physicians more important than supporting doctors' effort to remain at the patient's bedside rather than at the keyboard? MOC is coercive, hopelessly financially conflicted, and corrupt. Working physicians need Ohio representatives (and all state representatives) to examine the facts, not cave to the hospital and insurance company lobbies. Working doctors know the score now. Many any are quitting rather than subjecting themselves to MOC again and again just to keep money flowing to the ABMS and their member boards so they can keep working. Patients, particularly those in rural areas, lose when this happens. From it's inception, MOC was created from lifetime board certification, not for patient care quality or safety, but rather so ABMS officers and directors could pay themselves handsomely. It continuation is fueled by deception, political agendas, and cronyism. MOC also requires coercion and strongman tactics to keep the money flowing. No matter how our own bureaucratic colleagues might sugarcoat MOC on the pipedream of assuring patient care quality and safety, critical examination of the evidence clearly demonstates what an embarrassement the program has been to the integrity of US medicine.